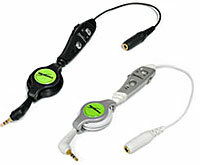 If you're fed up with having to use the rubbish headphones that came with your Treo, you may want to consider investing in BoxWave's Dual Handsfree Stereo Adapter. Like many other mobile manufacturers, Palm elected to use the non-standard 2.5mm headphone socket, meaning that you can't use your favourite headphones with the device. Although many electronics stores like Maplins carry simple 2.5mm (male) to 3.5mm (female) stereo adapters, your listening pleasure is going to be interrupted every time you take a call as you'll have to unplug your headphones. Not cool. 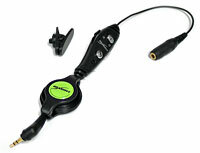 So here's where the BoxWave's Dual Handsfree Stereo Adapter comes in. The unit features a simple (gold plated) 2.5mm to 3.5mm adapter which connects up to a small control unit which includes an integrated microphone, single-touch answer call button, volume control, and a switch for toggling between music and handsfree phone mode. The adapter also comes with a removable lapel clip so that you can clip the microphone to your jacket, and to avoid the usual spaghetti tangle of wires, there's a clever cable retract/recoil design that winds in any excess cabling. We tested the adapter with a Palm Treo 650 and a pair of MDR-EX71SL Sony Fontopia in-ear headphones and, just for a bit of overkill, some Grado SR60 cans. Giving it a bit of welly with some MP3s played back on Pocket Tunes, everything worked as advertised, with the music mode automatically pausing the tunes whenever a call came in on the Treo. As soon as the call was finished, the music would kick back in again, so there was no need to go rummaging about in bags or pockets. Sweet. We also liked the retractable cable, although there's no denying that the combination of adapter, cable coiler and control unit added a bit of bulk. Although we initially had a problem with a noisy potentiometer (that's a volume control to most people, but we're trying hard to impress you here), Boxwave were quick to send out a replacement, so it looks like their customer service is on the case. 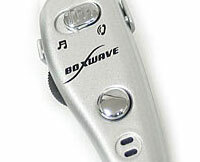 Overall, we found the BoxWave to be well worth the outlay (currently on offer from their site at $20.95) and a great investment if you want to be able to get the best music performance out of your Palm Treo 650/700p/700w. If you haven't got a Palm, you might be interested to note that Boxwave also do a Dual Handsfree Stereo Headset which replicates most of the functionality of the Palm version, but has non-removable headphones - check out their page for compatible models.